Yuri Vasiliev’s interview with Ilyumzhinov was published today and coincides with the signing of two contracts. 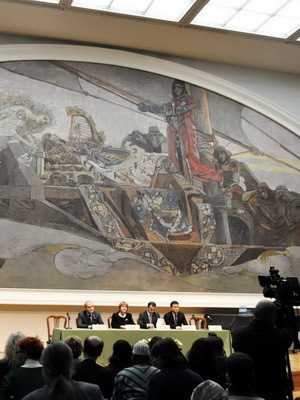 One was with Irina Lebedeva, the General Director of the Tretyakov Art Gallery, which will be the venue for the Anand – Gelfand World Championship match (photos of the signing ceremony can be found at the Chess Moscow website). The other contract is more controversial, and involves FIDE granting the company “Agon” the rights to hold the World Championship matches, Candidates Tournaments and World Cups for the next few years. 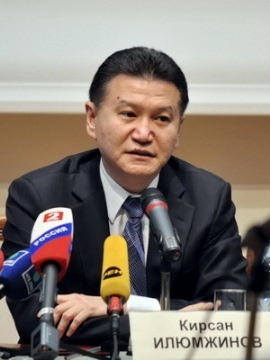 They will also be responsible for the Men’s Grand Prix, which Ilyumzhinov claims is about to make a comeback. 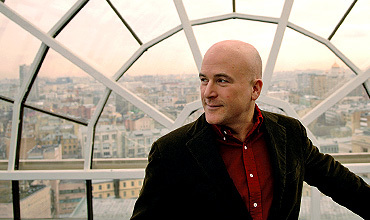 Agon is run by Andrew Paulson, an American businessman who’s worked in Russia since 1993. Ilyumzhinov told Vasiliev that Paulson first wrote to FIDE eight months ago offering to invest millions of dollars in chess. After long negotiations a contract was finally approved by FIDE at the recent Presidential Council in the United Arab Emirates (see ChessVibes for more details). FIDE also has financial guarantees. So, for example, the Candidates Tournament will, as I announced in your newspaper, start in London on 23 October, and half a million dollars is already being transferred to FIDE’s account this week. For the running of the coming cycles FIDE should receive around 10-12 million euro. As well as that, FIDE will, as before, get the 20% cut of the prize fund and a percentage of the profits that the head of Agon is counting on making in the next four years. It looks like “a rain of gold” for FIDE, but the American businessman probably didn’t just have business in mind when he said at the Presidential Council that he wanted to raise chess to new heights? Yes, of course, we don’t live by bread alone! It was also impressive and pleasing that Agon’s budget for this year includes a significant sum for the promotion of chess. In the next one or two weeks chess fans and professionals will get a clear schedule for the major events – with a list of the cities, dates and size of the prize fund. By the way, the prize fund will be increased, the tournaments will become more appealing and we hope that all the best players will take part. This year we’ll start with Chelyabinsk and Tashkent, and next year Agon is planning to hold these prestigious events in major world capitals: Paris, Madrid, Vienna and Lisbon. Could you give us some more detail on London? You told Sport Express that the Candidates Tournament would take place in the English capital from 23 October to 13 November. Is it being held using Azerbaijan money? Yes, it is. The sponsor of the London Candidates Tournament will be Azerbaijan. By the way, long before the end of the Candidates Tournaments their representatives are going to announce that they’re planning to bid to hold the World Championship match in 2013. Vasiliev here asks a long question (seemingly based on a slightly confused reading of Magnus Carlsen’s comments at ChessBase) about the dates for the Candidates Matches in London, noting that Carlsen is among those who’ve criticised the schedule and suggested holding the event in spring 2013. FIDE chose precisely those dates for compelling reasons. As you’ll recall, due to various circumstances we had to move the Anand – Topalov World Championship match and the Candidates Tournament. As a result the cycle dragged on for years. 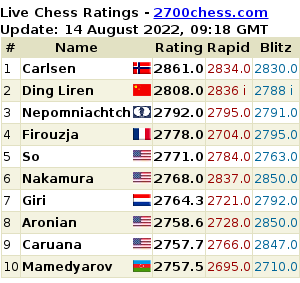 We were heavily criticised for that, and Grandmaster Carlsen was one of the critics. This year two stages of the Grand Prix will take place and next year we have to hold four, so we need to keep to the schedule. When it came to London there was an additional motivation: this outstanding chess event will take place immediately after the Summer Olympics. That will work to enhance the prestige of chess. Are Andrew Paulson and his Agon only interested in men’s chess? Initially Paulson and his team will only deal with men’s chess, but in the future they’re also planning a women’s Grand Prix and the Women’s World Championship. Does FIDE still have some leverage for influencing the decisions taken by Agon? Something like the UN Security Council veto? A kind of “interface” exists between FIDE and Agon – with two of their representatives and two of ours. If something doesn’t suit us we can block any decision. You can call that right a “veto”, if you like. In conclusion, what about your favourite child – the “Chess in Schools” program? Are you making any progress with that? Last year I visited something like a hundred countries and held talks with presidents, prime ministers and public figures. There was great interest in the initiative everywhere. I’m glad that representatives of big business also support FIDE. Today one of the biggest oil corporations worldwide will announce a contract with FIDE. We’ll receive a few million dollars for the development of the global “Chess in Schools” program and support for the chess movement on different continents. I wanted to ask what has happened to WhyChess? Is it continuing? Or is it dead? Everything is dead after Jan 8 item on Giri’s win. I was wondering that myself. I used to follow it everyday. But, I am thrilled to have found CiT!! Great chess articles wonderfully translated. Thanks! Thanks as well! Unfortunately WhyChess has stopped for now, although I’m probably going to translate one more of Vlad Tkachiev’s interviews. In general, I know he hopes to relaunch the site or something similar (better), but it’s a question of finances. Theoretically as I was writing all the news for the last few months I could start doing the same here, but I can’t afford to work that hard without any realistic way of making any money from it.